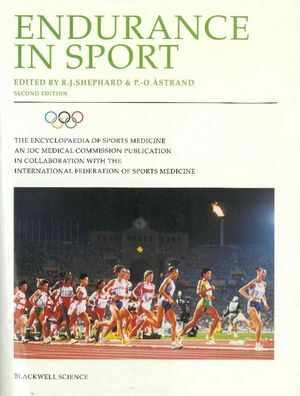 R. J. Shephard is the editor of Endurance in Sport, 2nd Edition, published by Wiley. Per-Olof Astrand was a Swedish professor of physiology at the Royal Gymnastic Central Institute in Stockholm 1970-1977, and 1977-1988 at the Karolinska Institute in Stockholm, Sweden, and a member of the Nobel Assembly at Karolinska Institutet. 1. Semantic, biomechanical and physiological definitions. 2 Individual and team endurance sports. PART 2: BASIC SCIENTIFIC CONSIDERATIONS. Part 2a: Biological Bases of Endurance Performance and the Associated Functional Capacities. 4 Anatomical and anthropometric bases of endurance. 5 Pulmonary system and endurance. 6 Cardiac function and endurance. 7 Muscle blood flow and endurance. 8 Regulation of blood flow and endurance. 9 Cellular metabolism and endurance. 10 Central nervous system and endurance. 11 Muscular factors in endurance. 12 Endocrine factors in endurance. 13 Food stores and energy reserves. Part 2b: Psychological Aspects of Endurance Performance. 14 Psychological aspects of endurance performance. Part 2c: Genetic Determinants of Endurance Performance. 15 Genetic determinants of endurance performance. Part 2d: Physical Limitations of Endurance Performance. 16 Mechanical constraints and economy of movement in endurance. 17 Endurance in hot and cold environments. PART 3: MEASUREMENT IN ENDURANCE SPORT. 18 Factors to be measured. 19 Sport-specific testing in laboratory and field. 20 Assessment of environmental conditions. 22 Muscular endurance, anaerobic threshold and blood lactate. 23 Metabolism in the contracting skeletal muscle. PART 4: PRINCIPLES OF ENDURANCE PREPARATION. 27 Influences of biological age and athletic selection. 28 Principles of endurance conditioning. 29 Diet, vitamins and fluids before and after prolonged exercise. 30 Haemoglobin, blood volume and endurance. 31 Smoking, alcohol, ergogenic aids and doping. 33 Prevention of injuries in endurance athletes. PART 5: SPECIFIC POPULATION GROUPS AND ENDURANCE TRAINING. 35 Endurance training and children. 36 Endurance training and women. 37 Pregnant women and endurance exercise. 38 Endurance training and the elderly. 39 Endurance sport for persons with disability. PART 6: CLINICAL ASPECTS OF ENDURANCE TRAINING. 40 Medical surveillance of endurance sport. 41 Pre-competitive examination of athletes. 42 Lung fluid movement in endurance sport. 43 Cardiovascular benefits of intensive exercise. 44 Cardiovascular risks of intensive exercise. 45 Reproductive changes and the endurance athlete. 46 Endurance exercise and the immune response. 47 Hyperthermia, hypothermia and problems of hydration. 48 Problems of high altitudes. 49 Ambient air pollution and endurance competition. 50 Influence of time-zone shifts. 51 Health benefits of physical activity. PART 7: SPECIFIC ISSUES IN INDIVIDUAL AND TEAM SPORTS. 55 Swimming as an endurance sport. 61 Soccer and other team sports. 63 The Physiology of Human-Powered Flight. 64 Endurance in Other Sports.